The SNMP OPC Server provides convenient "Specialty tags" to help users know more than the current value of a single polled OID. The tags include: History tags, Events tags, Table Offsets, and ScanFloor tags. Auto Discovery - Save time by using the Auto-Discovery tool to search your Ethernet network for managed network devices. MIB Import - Import MIB files from manageable devices and easily map network device MIB addresses to SNMP tag names. SNMP Traps Support - Many SNMP manageable devices can be configured to send unsolicited data to network management software systems such as our SNMP OPC Server. By configuring an SNMP device to send data without being "polled" such as when a critical system tag goes into an unfavorable state, you can reduce the need for "polling" the network device. SNMP driver supports receiving SNMP Trap data via Events tags as well as through defined Trap OIDs. Historical Data Attributes - Previous Value, Delta Time, Moving Average Historical values are generated by the SNMP OPC Server (not the remote Agent/device) when an OID has valid historical modifiers appended to it. Table Offsets - OID Table access is accomplished by enumerating columns of a table. The SNMP OPC Server uses an array-like notation for Table access. The Scan Rate Floor is the minimum rate to scan SNMP devices. The default is 1000 milliseconds. When set (to a non-zero value) the SNMP driver will never scan the remote device more often than the specified scan rate. Not all Ethernet network devices are SNMP managed. To help monitor any system from within your HMI, iSNMP automatically generates OPC tags for each unmanaged device defined. These "heartbeat" and "response time" tags provide a standardized and reliable way to monitor all devices in the Ethernet network. Kepware purchased all SNMP-related assets of COI Software in September 2007. 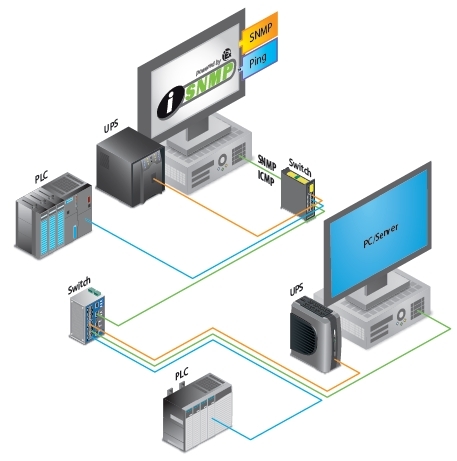 Kepware has developed a new iSNMP suite that "plugs-in" to Kepware's award winning OPC server architecture. The new drivers in the suite are, the SNMP driver for Managed devices and the Ping driver for Unmanaged devices. The OPC server which houses these drivers is Kepware's field proven KEPServerEX which supports the widest range of connectivity for OPC, DDE, and Native Interfaces. The Ping Device Driver is provided for monitoring your network devices via the ICMP protocol (Ping). The Ping driver was designed specifically for use with 32 bit OPC Server products. The Ping driver provides the ability to monitor the Status of a network device, and the time that it takes for the ICMP message to reach its destination and return a response, the RoundTripTime. All plug-in device drivers including the Ping driver provide communication timeout settings for Connect Timeout, Request Timeout, and an adjustable Retry or Fail After setting. The Ping driver also supports Device Auto-Demotion for Unmanaged devices. Users can adjust Auto-Demotion parameters to allow drivers to temporarily place a device off-scan in the event that it is not responding. This allows the driver to continue to optimize its communications with other available devices on the same channel as well as notify the client application of the event.